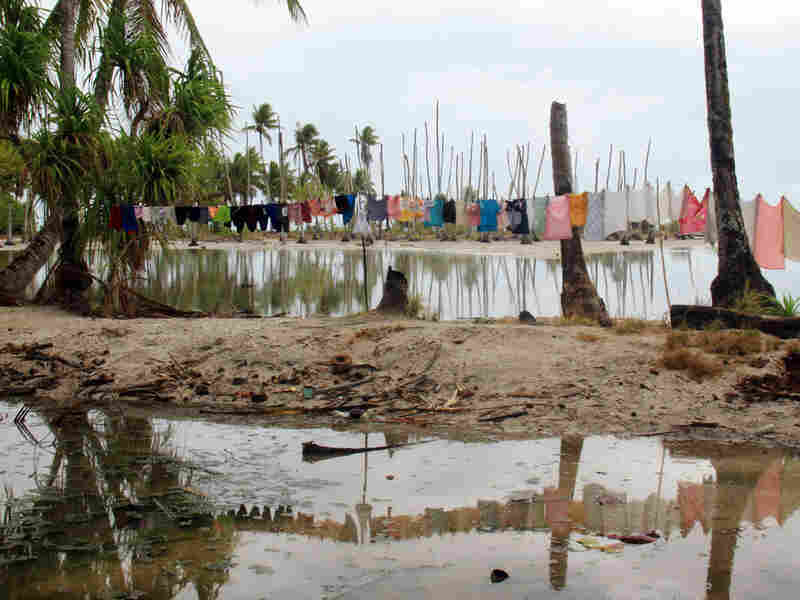 Climate Change And Faith Collide In Kiribati Scientists are predicting that average sea levels could rise as much as 3 feet by the end of the century. However, the country's deep religious beliefs have residents of the tiny island nation in the Pacific Ocean torn between God and science. From the sky, the country of Kiribati looks like strands of yarn floating on the sea: 33 tiny islands, scattered across an area of the Pacific Ocean more than twice the size of Alaska. Nearly half the population, more than 40,000 people, is crowded into just one of those strands –- the capital island, South Tarawa. The average height of the islands is approximately 6.5 feet. Already, land is scarce, and drinking water can be in short supply. There's nowhere to retreat. So concerns about climate change are felt very acutely here. Though estimates are rough, scientists predict average sea levels could rise as much as 3 feet by the end of the century owing to global warming. At the most recent round of United Nations climate negotiations in Cancun, Mexico, Kiribatian President Anote Tong said the rising sea could "ultimately lead to the demise of island countries like Kiribati." According to Tong, it could happen within 50 years. Many people in Kiribati, pronounced "keer-ih-bus," say they're already noticing changes in the environment. "We hardly get rainy seasons any more," says Deputy Secretary of Labour Akka Rimon, who lives on South Tarawa. "And then it gets really, really dry and hot. There's a water crisis here — water becoming salty or brackish." This is one of the chief concerns in Kiribati: protecting fresh drinking water — which collects in a lens beneath the islands — from prolonged droughts and encroaching salt water. Ata Merang, another South Tarawa resident, says she has noticed the extended dry seasons. But she also has noticed other changes. "The sea level, now it comes to the road, even to the houses," she says. On nearby North Tarawa, high tides have repeatedly ruined Jack Joe's crops. "When the tide is up, it really runs through the sand and kills everything," Joe says. "Cabbages and tomatoes, things like that. Cucumbers. Gone." Scientists aren't able to attribute these problems directly to climate change. Historical data in the region are spotty, and there are a number of other factors, like overpopulation and local construction, that also could be playing a role. Still, these are the types of problems they predict climate change to cause, and it also is expected to exacerbate existing environmental pressures. 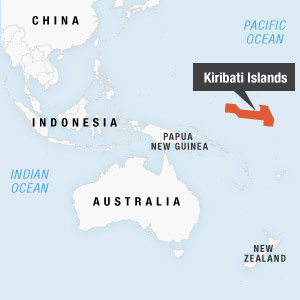 But even in a place as vulnerable as Kiribati, there are skeptics. "I'm not easily taken by global scientists prophesizing the future," says Teburoro Tito, the country's former president and now a member of Parliament. Tito says he believes in the biblical account of Noah's ark. In that story, after God devastates the world with a flood, he makes a covenant with Noah that he will never send another. Brian Reed has been writing about Kiribati's dilemma since November. See what else he has to say on NPR's blog, The Two-Way. So while Tito does acknowledge that global warming is affecting the planet and that he has noticed some impacts, he says rising sea levels are not as serious a threat as Tong and others are making them out to be. "Saying we're going to be under the water, that I don't believe," Tito says. "Because people belong to God, and God is not so silly to allow people to perish just like that." Tito is not alone in his views. Of the more than 90,000 people counted in Kiribati's last census, a mere 23 said they did not belong to a church. According to the most recent census, some 55 percent of citizens are Roman Catholic, 36 percent are Protestant and 3 percent are Mormon. As a result, many are torn between what they hear from scientists and what they read in the Bible. President Tong says people have questioned whether his focus on climate change means he does not believe in God. And yet, on a personal level, Tong says, he understands the skepticism. "There's always this deep desire to deny it," Tong says. "And I don't want to get trapped into that because that's an emotional reaction. My emotional reaction: 'No, it will never happen.' But the facts are there in front of us. The sea level rise is going to put us underwater, much earlier perhaps than we all anticipated." On one of Kiribati's remote outer islands, Abaiang, there's an empty sandbar that shows how vulnerable the islands are to changes in the sea. It was once an entire village, called Tebunginako. Now there's nothing but dead coconut trees and a crumbling sea wall. It feels like an ancient ruin. The village of Tebunginako, on one of Kiribati's remote outer islands, Abaiang. Residents were forced to relocate after the sea inundated the village. Aata Maroieta used to live there, along with several hundred neighbors. About 35 years ago, he says, the sea began to inundate the village. It ruined their crops and their drinking water. Eventually, a large storm came and tore away their houses. Maroieta points to the lagoon. Through an interpreter, he explains that the maneaba, the large meetinghouse found in every Kiribatian village, used to be nearly 30 feet offshore. Today, there's nothing but water. Some of the villagers have rebuilt farther inland, and others have scattered for good. As with other environmental changes, there were likely a number of factors beyond global warming that played a part in Tebunginako's demise. But regardless, people in the country point to it as a frightening harbinger of what could be in store for the rest of Kiribati, if sea levels continue to rise. Editor's Note: Brian Reed is NPR's first Above the Fray Fellow. The fellowship supports journalists who wish to report from a "far-flung or otherwise under-reported" region of the globe.